This download includes 6 pages, teaching students about Pie Charts, Line Graphs and Bar Graphs. For each type of graph, there is a page which tells students how the graph is used. Then there are instructions for an sorting/graphing activity. The second page for each includes a large blank graph for students to fill in. Pie Charts have students graph Gold Fish. Bar Graphs have students graph M&Ms. 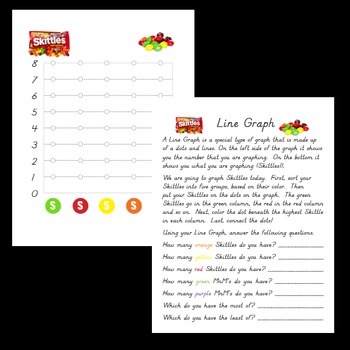 Line Graphs have students graph Skittles. These worksheets are great for introducing new graphs and the students love them because they get a snack at the end!